Nowadays, people tend to prefer working on their chess by studying opening variations with engines, neglecting the practical side of our game. 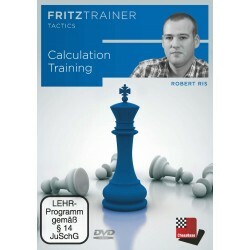 This DVD emphasizes the importance of training your calculation skills. Dutch IM Robert Ris made a selection of training material which he uses in lessons with students ranging from 1400 to 2400. But Ris believes that this material is suitable for players of various strengths because anyone can benefit from practicing calculation in a structured way. On this DVD, the viewer is invited to determine the needs of the position before randomly picking candidates moves. The author then shows basic calculation techniques which help you to accelerate and to improve your thinking process. The first chapter focuses on forcing moves (checks, captures, threats) to keep the initiative or to continue with an attack. In the second part, Ris explains how to eliminate candidate moves to improve the decision making process. You can also give your creativity (imagination) a boost by going through spectacular examples in which it seems at first almost impossible to find a good continuation. In the end 10 test puzzles allow you to test your calculation skills in practice.